Baby birthdays are a joyous milestone that parents and family members love to celebrate. Whether your baby or toddler is turning one, two or three, it’s a moment you’ll never forget. An adorably sweet and personalized baby birthday invitation is the perfect way to gather friends and loved ones to celebrate with you. Animals: From favorite zoo animals and farm friends to under-the-sea creatures and cuddly woodland wildlife, choose from our collection of animal-themed baby birthday invitations to suit your baby’s wild party theme. Disney: Whether your little one is a fan of Mickey, Minnie or Winnie the Pooh, choose from several favorite characters to complement your baby’s Disney-themed birthday. Floral: Get your baby girl’s birthday party off to a chic start with invitations that feature pretty floral patterns and bright blooms. Nautical: Sailboats, sand and beachy designs are perfect for your child’s nautical or beachside birthday party theme. Sparkle & Shine: Make an impact when you choose from our premium baby birthday invitations in glitter and foil-stamped styles. Invitations crafted with real glitter or foil bring a touch of shine and a one-of-a-kind look to your party stationery. And these designs are just the beginning. 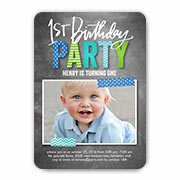 Browse our collection of baby birthday invitations to find more themes and styles that suit your unique birthday girl or boy. From ladybugs and princesses to bow ties and balloons, you’re sure to find an invitation design that lets your little one shine. 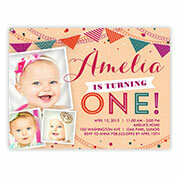 Once you find the baby birthday invitation that’s perfect for your son or daughter’s party, make it yours. Customize the design in a variety of ways with our easy-to-use personalization options. Personalize details such as fonts, colors, sizes, trim styles and more, and upload your favorite photos of the happy birthday baby. Don’t forget to include all the important information about the party, including RSVP details. Now that your perfectly personalized birthday invitations are complete, browse our collection of kids gifts perfect for young toddlers. Put your little one’s face right into their own delightful personalized story book. Create a custom baby blanket, teddy bear or night light to make their bedroom even cozier. Or choose from adorable tableware to commemorate their birthday and make mealtime fun.